NIAGARA FALLS, NY--(Marketwired - Nov 12, 2013) - JBI, Inc. (the "Company" or "JBI") (OTCQB: JBII), a clean energy company that recycles waste plastic into liquid fuels, today filed its third quarter 2013 results on Form 10-Q and announced quarterly fuel production of 170,725 gallons, the highest recorded quarterly production to date. For the three months ending September 30th, JBI, Inc. reported a total of 170,725 gallons of fuel produced with approximately 134,632 gallons produced as in-spec diesel, and 36,093 gallons produced as naphtha. This represents a 42.37% increase in total gallon production as compared to the quarter in which the Company previously achieved its highest recorded production totals, the fourth quarter of 2012. "We're all extremely pleased with the fuel production momentum that we've been able to continue through the third quarter. Not only does it continue to validate our process, but it serves as a great example of what our process is capable of to potential joint venture partners and Processor sale customers," stated JBI Chief Executive Officer Rick Heddle. JBI Founder and Chief of Technology John Bordynuik commented, "We continue to have success with Processor 3 as we gradually ramp up our feed rates. Our second run with Processor 3 was approximately 42 days, beginning on August 30th and ending on October 10th. This uptime and subsequent quarterly production numbers serve to continue validating Processor 3 as our flagship processor." "Our third quarter metrics show a step in the right direction for JBI," stated Chief Financial Officer Nicholas Terranova. "Our continued momentum with production and our renewed focus on costs, specifically feedstock cost and labor cost, has helped contribute to a quarter that we feel is indicative of progress. We remain extremely focused on costs and look to continue to show progress going forward." The Company has filed its Quarterly Report on Form 10-Q for the third quarter 2013. As reported on Form 10-Q, the Company reported $302,275 in total revenues, a 59.5% increase from the third quarter of 2012. The Company reported $277,276 in fuel revenues, a 132.7% increase from the third quarter of 2012 and costs of goods sold related to fuel revenues of $263,590, a 76.9% increase from the third quarter of 2012. 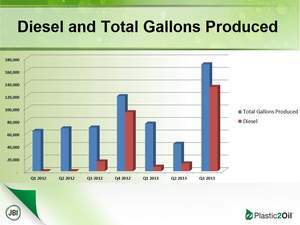 The Company produced 170,725 total gallons of fuel in the third quarter of 2013, compared to 69,708 gallons produced in third quarter 2012, a 144.9% increase. Average cost per gallon was $2.03 per gallon, compared to $2.32 per gallon for the third quarter 2012, representing a 12.5% decrease in cost per gallon. Upon the closure of the Company's Regional Recycling Plant ("RRON"), the Company identified a number of significant sources of optimal feedstock which can be delivered directly to its Niagara Falls plant, without the need for pre-processing. The Company is receiving this product at a lesser price than the cost of the plastic that needed significant pre-processing. As JBI continues to receive this product and turn its inventory, these costs are expected to decrease in future periods. For the quarter ended September 30, 2013, JBI recorded a gross profit of $29,476 as compared to a negative gross profit of $10,669 for the quarter ended September 30, 2012. The gross profit related to fuel sales, $13,686, for the three months ended September 30, 2013 was positively impacted by the Company's decision during the third quarter of 2013 to secure optimal feedstock that is processor-ready and without further need of pre-processing, as compared to the same period of 2012. The Company finished the third quarter with $144,044 in finished goods inventory. Net loss for the three months ended September 30, 2013 was $4,052,930, compared to $2,996,415 in third quarter of 2012. These losses consisted of losses from continuing operations of $3,100,873 and $2,763,118 for the quarters ended September 30, 2013 and 2012, respectively, and losses from discontinued operations of $952,057 and $233,297 for the quarters ended September 30, 2013 and 2012, respectively. The increase in net loss for the three months ended September 30, 2013 was driven by the discontinuation of operations at RRON. JBI incurred a net loss of $9,823,166 for the nine months ended September 30, 2013 compared to a net loss of $9,892,913 for the nine months ended September 30, 2012. These losses consisted of losses from continuing operations of $7,788,683 and $9,401,133 for the nine months ended September 30, 2013 and 2012, respectively, and losses from discontinued operations of $2,034,483 and $491,780 for the nine months ended September 30, 2013 and 2012, respectively. Readers of this press release are encouraged to review the Company's Form 10-Q in its entirety, including the section titled "Management's Discussion and Analysis of Financial Condition and Results of Operations." Since 2012, JBI's business plan had been to primarily focus on sales of our fuel for revenue. At this stage in the Company's growth it has been determined that joint ventures and P2O Processor sales will be the primary focus of JBI's business plan moving forward. To date, the Company has entered into entry-level talks with various companies with regards to potential sale of machines. The Company is exploring different options for ways to continue to generate revenue through joint ventures and still plans to continue selling fuel for revenue, as well as to demonstrate process viability. "With the continued validation of our technology and most importantly, Processor 3, the Company's business plan continues to evolve accordingly," stated CEO Rick Heddle. "We are confident in our ability to execute this plan in coming quarters." After Processor 3's second cycle, JBI began the fourth quarter with a full cleanout and maintenance of its fuel tanks, as well as a normal machine maintenance and turnaround in order to try and assure undisturbed production throughout the rest of the quarter. The Company does not anticipate this cleanout, which took roughly three weeks for both processors and all fuel tanks, as having a pronounced negative effect on quarterly fuel production. The company plans to elaborate on the content of this press release during its previously announced and scheduled conference call at 11:00am EDT this morning. Details on the conference call can be found on the company's website located at www.plastic2oil.com. A transcript of the conference call will be made available after the call on the Company's website. For further information about the Company's third fiscal quarter 2013, including its financial results, readers of this press release should review the Company's disclosures in its Quarterly Report on Form 10-Q, which is publicly available on the website of the Securities and Exchange Commission at www.sec.gov. JBI, Inc. is a clean energy company that recycles waste plastic into liquid fuels. JBI's proprietary Plastic2Oil technology can deliver economic and environmental benefits by replacing refined fuels and diverting waste plastic from landfills. For further information, please visit www.plastic2oil.com.